Alpaca fleece has become my favourite fibre to work with when knitting/crocheting. Whether 100% or blended…100% has a lovely drape but little memory until you blend it with another fibre. It was interesting to see how the judges considered each animal. Aside from checking their teeth, ears, tail, fleece etc, one the judges also had an armband of velcro that they would use to draft bits of fleece from each animal. Cool to see! 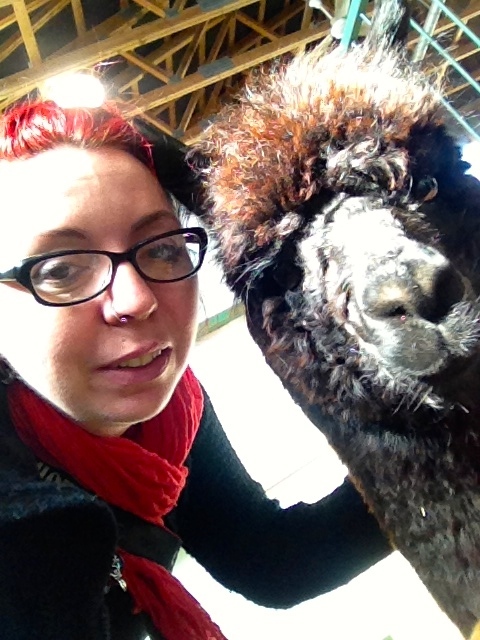 Over the past couple of years, I try to visit local alpaca farms when I can to purchase fleece, yarn, or simply ask questions to learn as much as I can. Look at those faces!!!! So bloody cute! 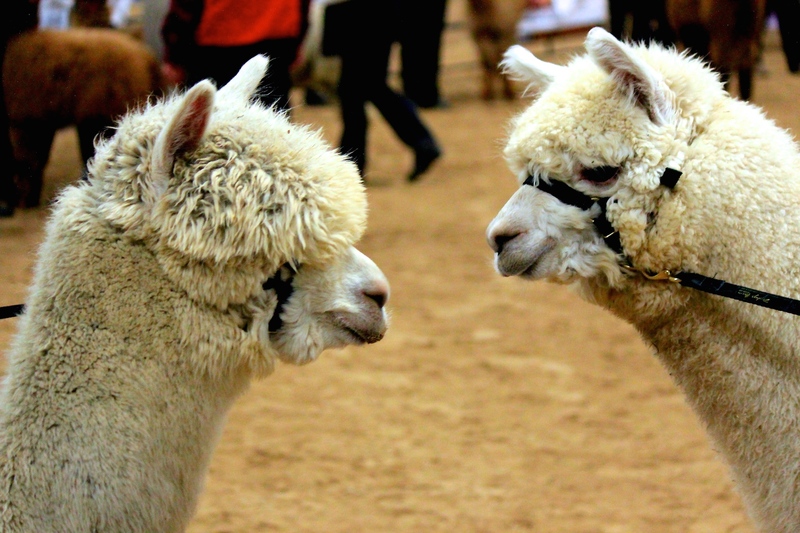 So, yes, I am an alpaca fan. 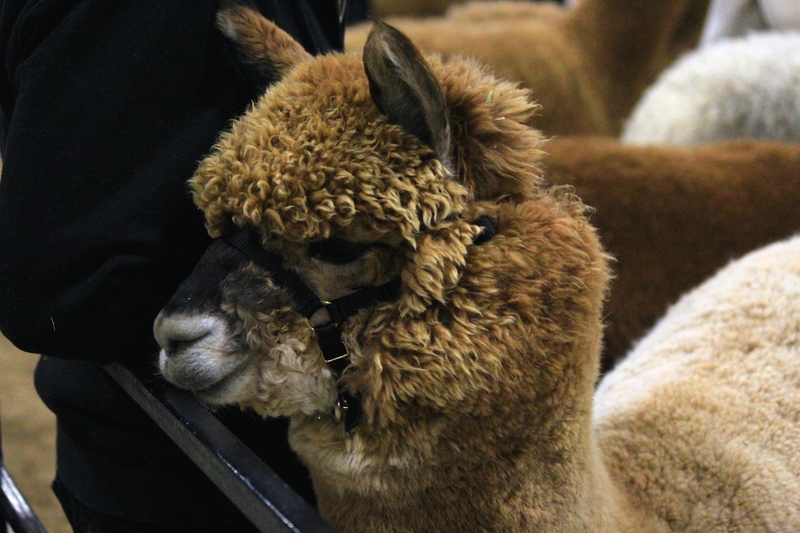 There are many reasons for this…..
1) Their fleece is known to be hypoallergenic. Different from wool in that it has next to no lanolin or grease and does not go through the same scouring and chemical processes that wool tends to go through. 2) They hum to communicate! How cool is that! 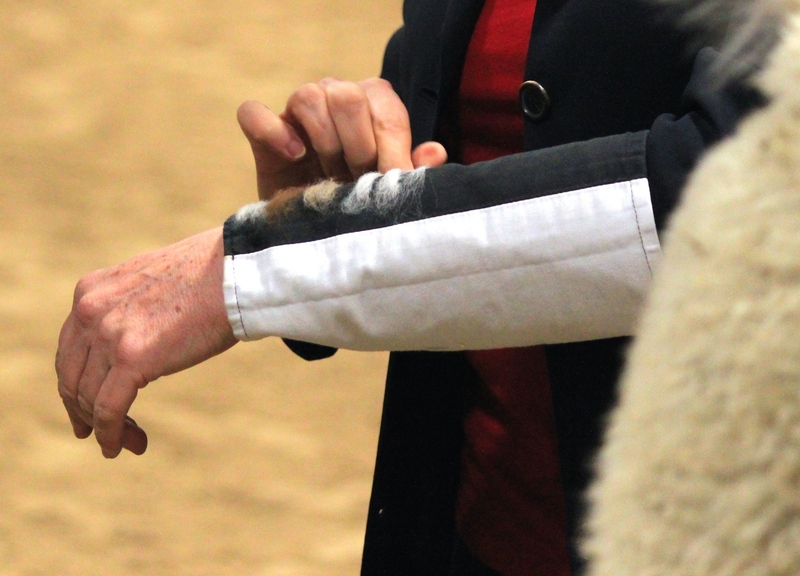 3) Their fleece is gorgeous…reminiscent of cashmere….often very soft and silky. 4) They like to photobomb! 5) Their husbandry and care is fairly simple from what I have been told. Less work than sheep. I had one woman once say they were less work than chickens! 6) They are Star Wars fans and are skilled at imitating Ewoks! 7) They tend to “go” in a few spots over and over again, making for easy clean up, and their poo can make great fertilizer! 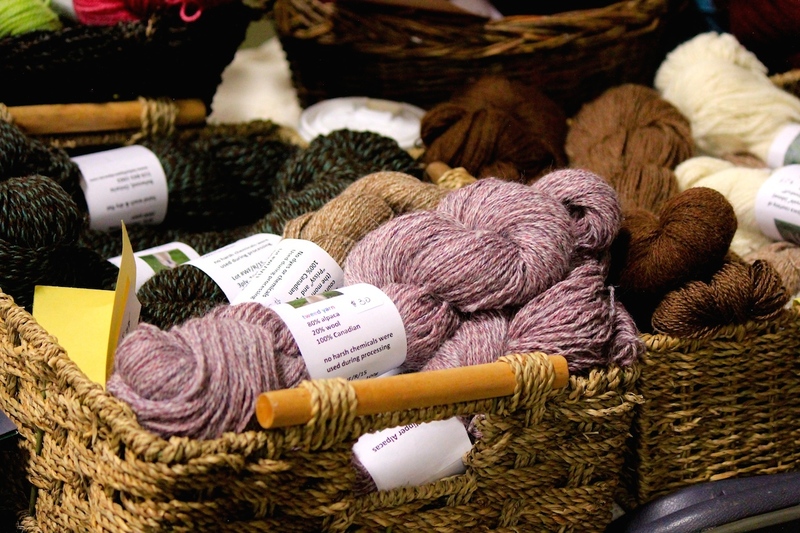 Lady Slipper Alpacas was on site selling roving and yarn. Some of the colours were gorgeous….both 100% and blends. The owner, Wendy, was warm and friendly. 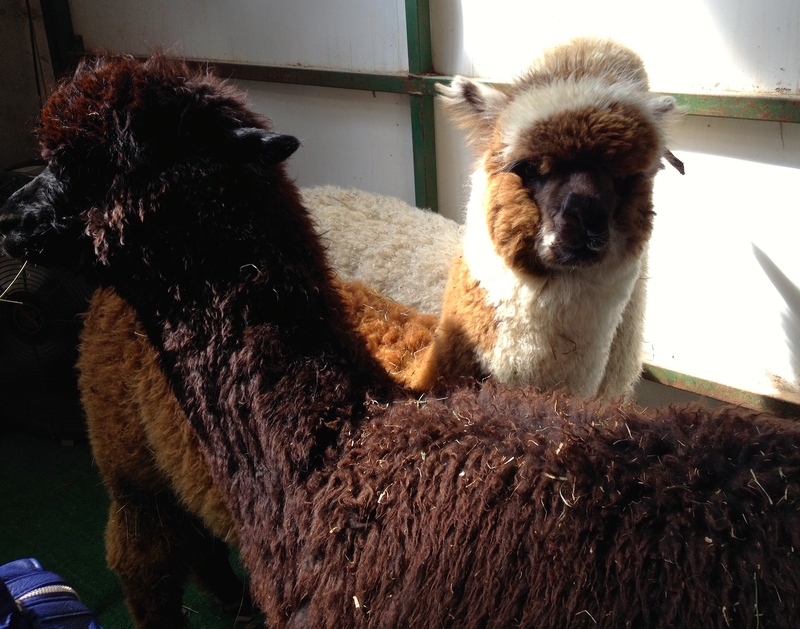 We stood and spoke with her for quite some time about the yarn, her animals, their care. You could tell she was very passionate about her herd and their care. She also told me about the Woodstock Fleece Festival…so guess where I’m going to be next October!! 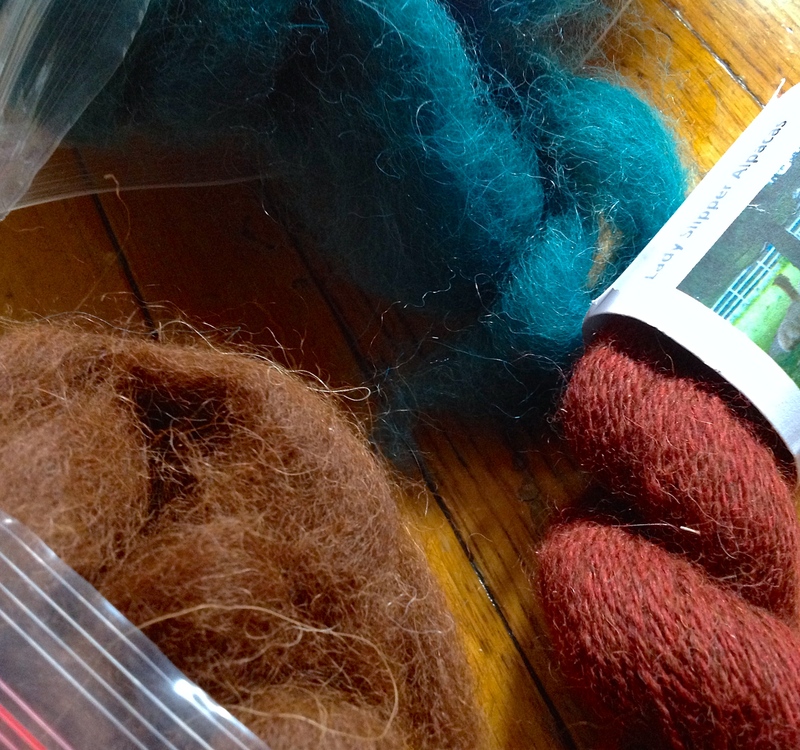 I may not have picked up the yarn in the picture above, but I still ended up with some fantastic fibres! Towards the end of the show, we still hadn’t had the opportunity to pet…okay snuggle,/cuddle/fondle/pick a word! lol…an alpaca. 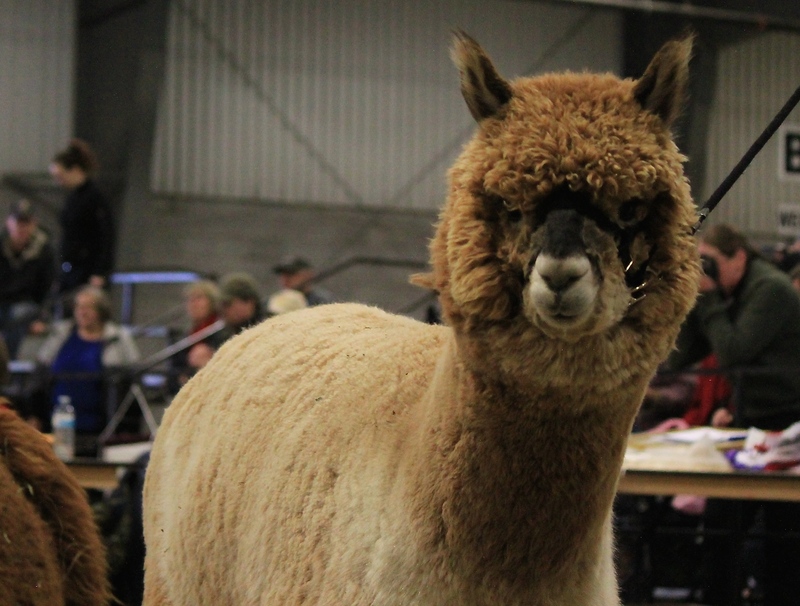 We were standing ringside after the final competition and a woman, Mélanie, attempted to pass behind us with her year-old alpaca. I couldn’t help but ask if we could pet the alpaca, whose name was Effie. Mélanie was so lovely and obliging. 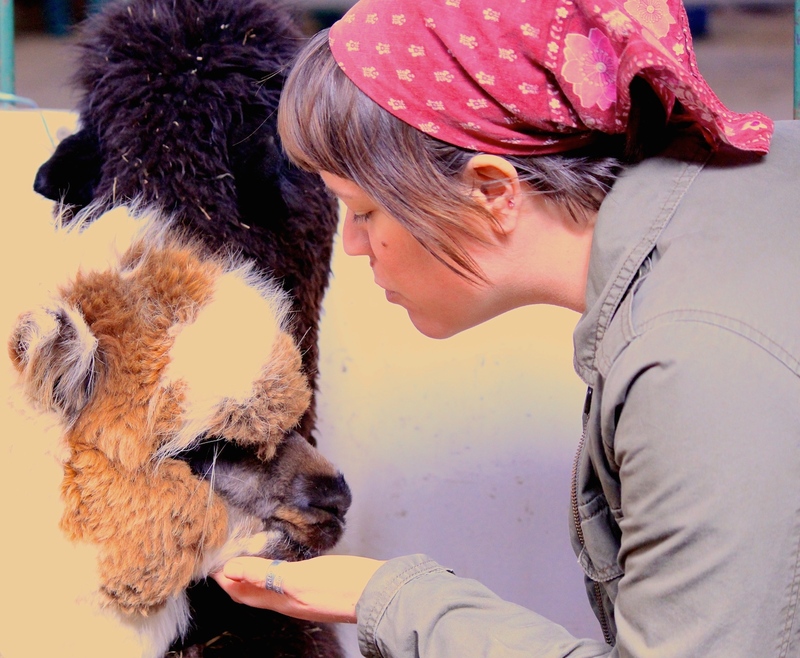 We had the chance to feel how incredibly dense yet soft Effie’s fleece was, and then we were invited to to the barn and see Mélanie’s other alpacas. So exciting!! All three of them were comfortable with us invading their space and hanging out in their stall with them. 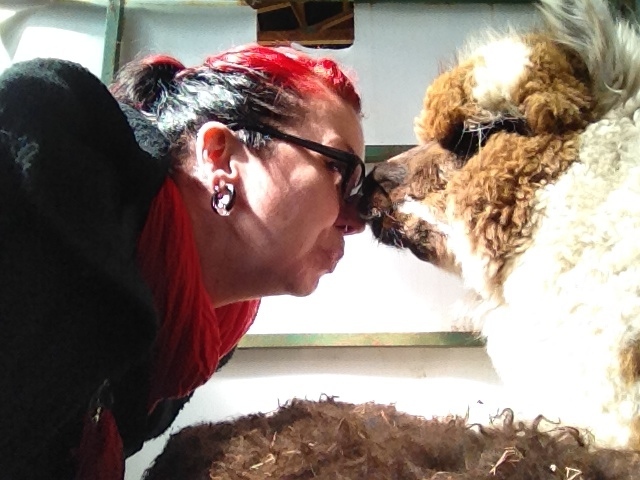 We even got alpaca kisses! So freakin’ cuddly and comfortable with people! I wanted to bring them all home! Special note about Evelyn’s fleece…it looks so chocolate-y brown on the outside but when you part the fleece and look at the coat beneath, it is a pure black. So absolutely gorgeous! 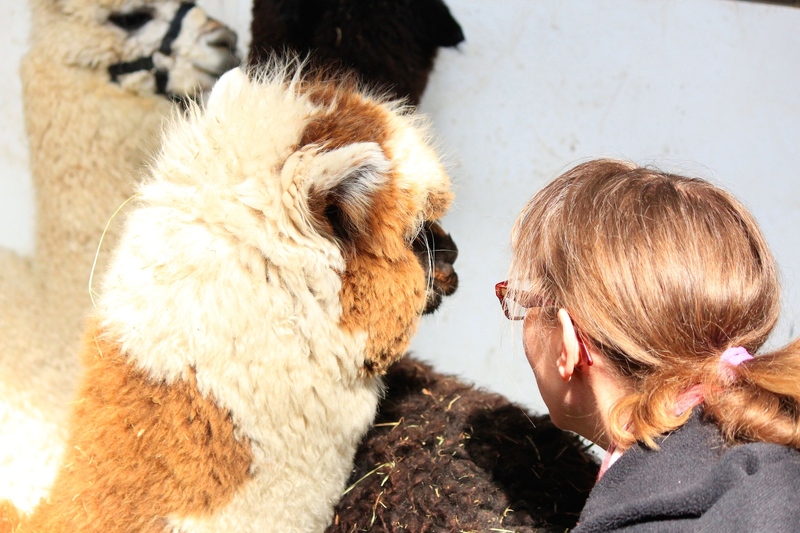 Thanks to Mélanie for spending so much time with us…letting us make friends with her alpacas and answering all our questions…if ever I were to find a way to have my own alpaca farm, I would be willing to head to Québec and purchase my animals from Mélanie’s farm Les Alpagas de la Petite Côte. Not only because Mélanie was so friendly and kind but also because her animals are so healthy and happy. She spoke at length about how she cares for them and you could tell they were members of the family! 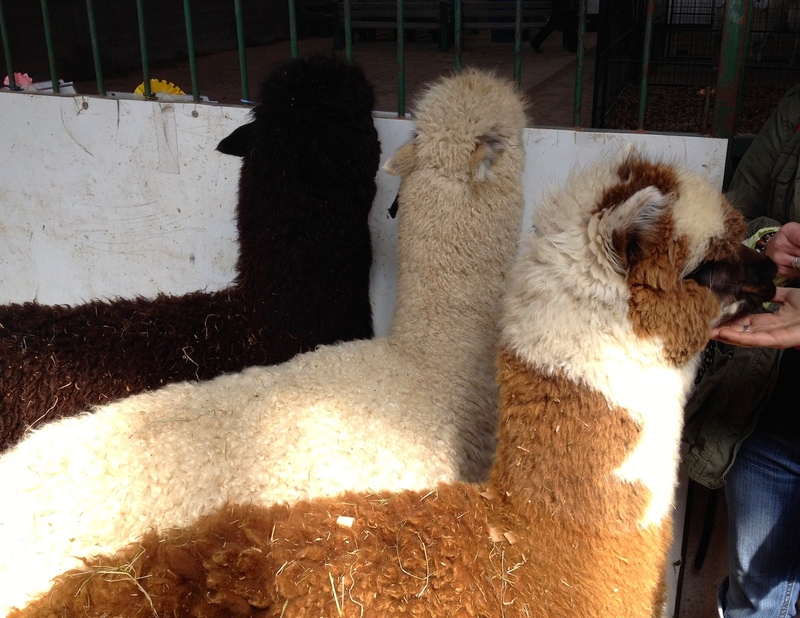 So, at the end of the day, I left with some beautiful fibre and a deep-seated wish to one day be an alpaca farmer and have some of these awesome animals happily grazing on land of my own! Next postTo Spin or not to Spin…Red & Turquoise for the win!